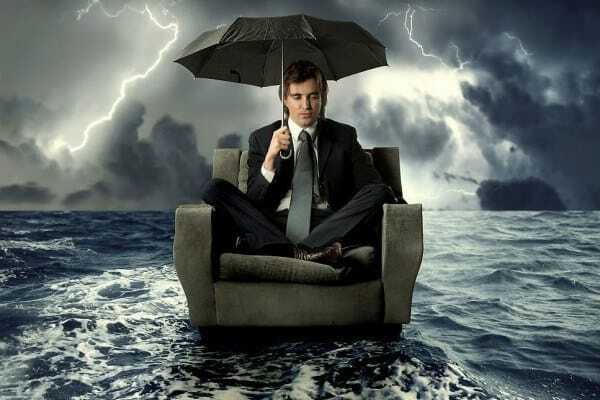 GOVERNMENT QUIETLY ADMITS WEATHER MODIFICATION! In this 2016 article, Ryan Christian shows that the government has admitted their intent to modify the weather. While that’s a far cry from disclosing the full agenda behind chemtrails, it effectively dispels the “conspiracy theory” label. Still, the average person continues to find it unthinkable that the government would modify the weather. This has been seen many times in recent years. A perfect example of this is weather modification. Weather modification, geoengineering, chemtrails; these are all topics that if brought up in most circles today, would garner the speaker the telltale look that most Truthers have become all too familiar with. It is a look that has been ingrained into all who have opted to cast aside their critical thinking for their comforting daily lie. There is a herd mentality that has been established that causes even those on the fence or those interested in “outside the box” ideas, to fall in line while surrounded by the docile mass. 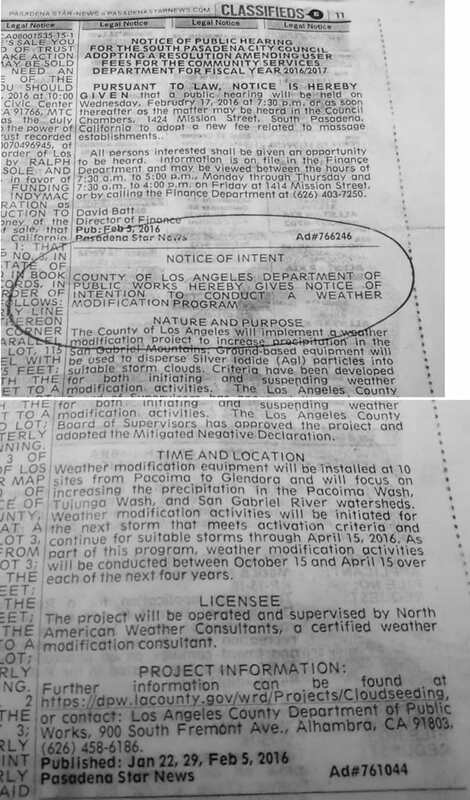 So when the Pasadena Star recently released a government “Notice of Intent” on page 11 of the Classifieds, announcing their plan to begin weather modification in Los Angels County, it became clear that those blank stares should be turned inward, for some much-needed self-reflection and reevaluation. Obviously the appropriate area of the paper to release such a controversial topic is the classifieds, where it will no doubt be noticed by all. Sarcasm aside, it is clear they did not want anyone to take notice of this declaration of weather manipulation that has been fervently denied up until last year. Many were also unaware that in 2014 the Navy publicly confirmed previous conjecture in regards to weather modification and the HAARP facility. Even after this statement, which was no doubt rationalized away by those unwilling to accept the reality currently slapping them across the face, the internet continued to be awash with “conspiracy theorist” slander and ridicule when discussing weather modification. Be careful that the product is not present at a concentration level above TLV(threshold limit value). Check TLV on the MSDS and with local authorities. Do not ingest. Do not breathe dust. Wear suitable protective clothing. In case of insufficient ventilation, wear suitable respiratory equipment. If ingested, seek medical advice immediately and show the container or the label. Avoid contact with skin and eyes. When an idea has been thrown out that contradicts one’s carefully constructed reality, their lifelong inculcation of specific ideas and beliefs that support the mainstream narrative has taught them to shut down completely. Not a moments thought is given to the possibility that the idea might have some merit or factual representation, because if the idea was given its proper consideration and found to be correct, even slightly possible, their entire world is suspect. This scares the life out of the average mainstream believer. While many here would insert the appropriate Orwellian reference, Aldous Huxley had a slightly different yet equally scary perception of the future. In his book Brave New World he suggested a future where citizens would be flooded with so much information that the truth would be drowned in a sea of irrelevance. It is not hard to see the logic in that thought process when one looks at the overwhelming amount of information, misinformation and outright lies perpetually circulating on the Internet. It becomes hard to know one’s own opinion when over saturated with constantly conflicting narratives. This produces a public that is no longer interested in activism or advocacy because it would appear to be ineffectual at best. The sad but unfortunate truth is that the United States government has become the very thing this nation was founded to prevent. Despite the fact that the country wasn’t able to make it through five presidents before we began to see the cronyism and unilateral decisions that are rampant today, it is easy to see the virtue and justness within the founding ideals of the United States. History has shown us time and time again that human nature will always play its part in any position of power; man is inherently capable of both extreme good and evil. This was exactly the logic behind the second amendment, regardless of how many have attempted to dilute or distort its meaning with modern association. 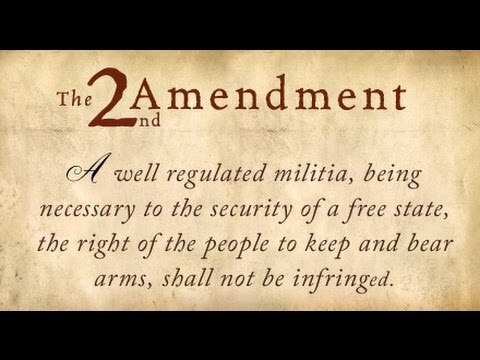 The American people have a right to defend their inalienable and self-evident rights against what the founding fathers saw as an inevitable eventuality: a tyrannical government. They knew that even men in that very room, had the potential to steer the nation in the direction we now face today. What this nation is in dire need of is not a violent revolution, but a revolution of the mind. Americans need to begin to see the danger of current circumstances and the inevitability of history coming full circle. The history of the world if rife with leaders turning corrupt, people rising up to establish order, and repeat. This is due to the inherent qualities of any human being; we are all subject to greed, desire and ambition. All have skeletons in their closet; simply being elected to office does not somehow strip one of their human characteristics. Yet the people tend to cast these public officials is a light of morality by default, when our own nation’s history strongly shows otherwise. The American people can no longer refuse to see the dangers at its feet that are quickly becoming perilous. To ignore the very real dangers of manipulating the ionosphere, and injecting it with potentially harmful materials, or to disregard that this type of government experimentation is happening at all, is very naive and irresponsible at best. But to ignore the fact that up until recently the entire subject was denied, and has now been nonchalantly admitted as if it was commonplace all along, is just reckless. What is important to the future of this country is that each individual personally decides to give equal consideration to all possibilities, despite any pre-conceived misconceptions that have been subtly cast out into American culture for decades.